Spring is suddenly upon us and the weather is cooperating (at least for now). Our yards and flower beds may still be dormant, but the spring growing season is not far off! 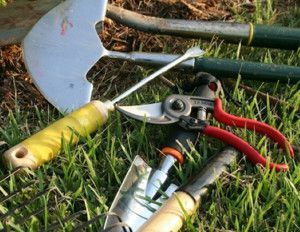 Soon we will need to go grab those trusty ‘ole tools and get back to digging, pruning, and cutting all throughout our yards. Now is a great time to think about which tools are in need of some ‘tlc’. Bring your worn and dull garden tools to us for a hardware make-over (better known as a sharpened blade). Did you know that we can sharpen many of your garden tools for less than $10 each. Stop by our Plumbing Department and drop off any dull tools that you would like to be refreshed. We will grind the blades down and put a nice new edge on their for you! We just ask that you leave the tool for a few days and we will give you a call when completed. We are able to sharpen most blades, including lawn mower blades, hand pruners, loppers, grass clippers, hedge shears, axes, hatchets, knives, and scissors. Any edge that is wavy or irregular typically can not be sharpened, but those are few and far between. Stop by or give us a call if you have any questions!